Welcome to my list of easy beginner guitar songs! When I was first learning to play guitar, I didn't know what songs were good for beginners. I really needed a list of easy guitar songs I could reference. Instead, I would get frustrated when I would see a song and then learn I didn’t have the skills needed to actually play the song. So I created this list of good beginner guitar songs to help you have fun with your guitar faster. These four chords alone can help you get through a lot of songs. If you see a chord that says Em7, play Em. Cadd9, play C. Dsus4, play D. G7, play G. You can substitute Em, C, D and G for any chord that starts with Em, C, D, and G.
After that will be a subset of songs that use easy open chords. You will find no songs on this list that uses barre chords (I have easy beginner song fixes for F and F#m) as I find those to be more intermediate type songs. You can find more intermediate songs at my full Guitar Chord Charts List. Strumming: Keep it simple. Sticking with all down strums is the best in the beginning. If you need more time to change between chords don't do all four. Try 1, 2 or 3 strums. Beatles, The - Eleanor Rigby - TWO CHORD SONG! 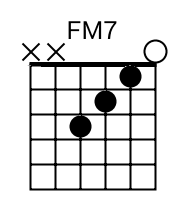 NOTE: If you can play an A chord, you can play the easy F#m chord below. It plays like an A chord on the bottom three strings. 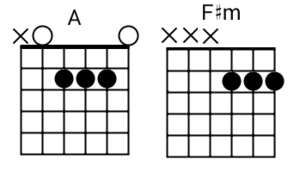 NOTE: If you can play a C chord your can use an easy version of an F chord below. This is a very short list of good beginner guitar songs that you can play along with easily and do not require a lot of skill to play. You can play these songs on either the electric of the acoustic guitar. Want to learn how to play along with these beginner guitar songs even better?